Walt Disney World guests love to stay at Monorail Resorts. Disney fans love to spread information—and sometimes misinformation—about the Monorail system and the possibility that it will be expanded. Its in writing from Disney! Dont let the Monorails higher noise and light levels bother you. 18. This resort is located near stores, restaurants, entertainment areas, and other public establishments with nighttime hours of operation which may result in higher noise and light levels, including but not limited to fireworks and music. In addition, easement rights for the purpose of constructing, maintaining and supporting the Monorail transportation services (which also may result in higher noise and light levels and views of the Monorail system) as part of the larger Walt Disney World transportation system (which may or may not service the Resort) have been reserved. There are no current plans to expand the Monorail system. Why is there a Monorail easement through Disney’s Saratoga Springs Resort—a legal right for the Monorail to cross the property—if there are no plans to expand the Monorail system? Actual image from a 1977 booklet, Your Complete Guide to Walt Disney World. The easement was in place long before the property was Disney’s Saratoga Springs Resort. In fact, the easement was in place before the property was called the Villas at Disney Institute. 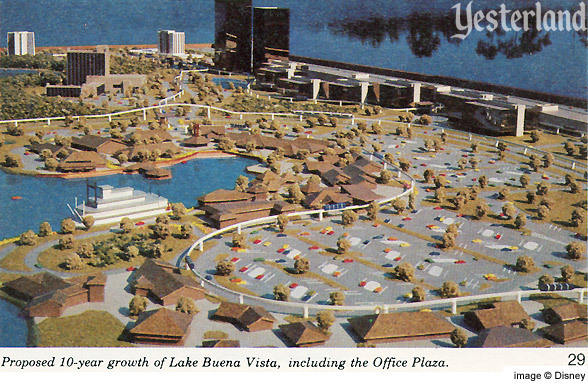 The easement goes back to the early days when there were ambitious plans for an extensive Monorail and PeopleMover system to connect all parts of Walt Disney World, including the shopping area that was then called Disney Village and the Office Plaza planned along Interstate 4. So the easement still shows up in legal documents. Nobody should take the easement as an indication that the Walt Disney World Monorail is coming to the Saratoga Springs Resort. If you stay there, plan on traveling to the parks by bus. This is the second of three Monorail stories today. Click Here to continue to the third one. 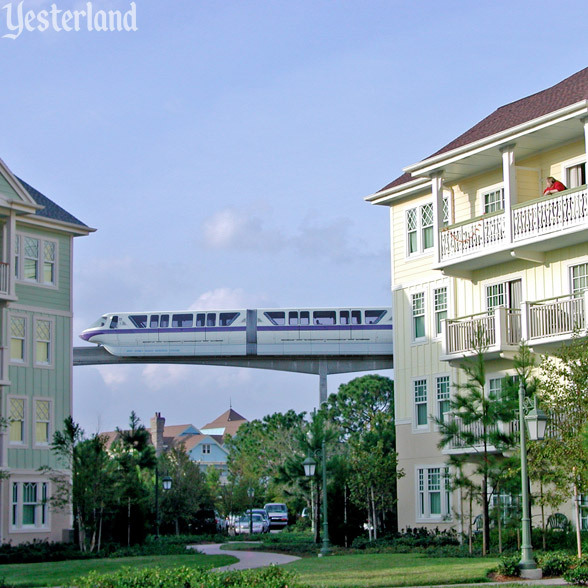 “Photoshopped” image of Disneys Saratoga Springs Resort: 2008 by Werner Weiss, based on 2004 resort photo and 2006 monorail photo by Werner Weiss. 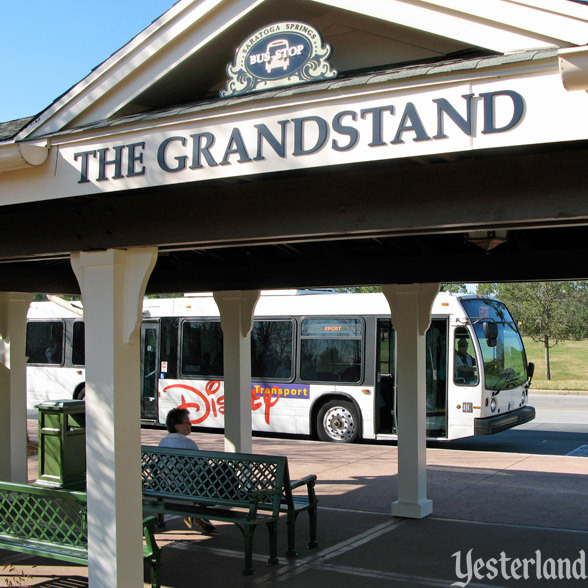 Photo of a bus stop at Disney’s Saratoga Springs Resort: Werner Weiss, 2009.